Improving the user experience and moving to a single complaint management solution for all contractual compliance complaint types has been and will continue to be the focus over the next few months. 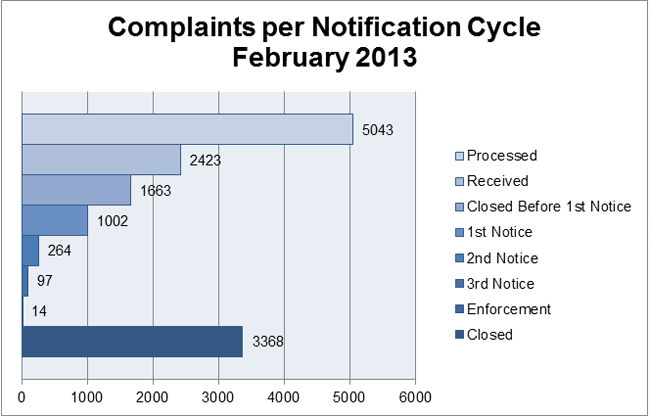 Over the next few weeks the user, also referred to as complaint reporter, will see improvements to filing complaints. Eventually, the current links listed below will be replaced by one link for a one-stop complaint submittal landing webpage. The user will be kept informed during the complaint process. Communication will consist of clarification, acceptance or rejection emails and a closure status email of the complaint. The closure status email will also include an invitation asking the user to complete a five-question feedback survey. Registrars will also receive closure emails with the survey link when the complaint is resolved. As previously communicated, the Whois Data Problem Report System (WDPRS) is scheduled first to migrate to the new and enhanced system. Enforcement Process was also added in this phase to complete the automation from prevention through enforcement. The phased rollout, by complaint type, will launch in mid-March and over the following few weeks. ICANN thanks the three pilot registrars, Blacknight Internet Solutions, eNom and GoDaddy, for their time and effort to test this first migration to the new system. This effort is aligned to the ICANN commitment to strengthen the Contractual Compliance program and operations. Once all complaint types are migrated to one platform, ICANN will provide additional performance metrics and improved reporting. 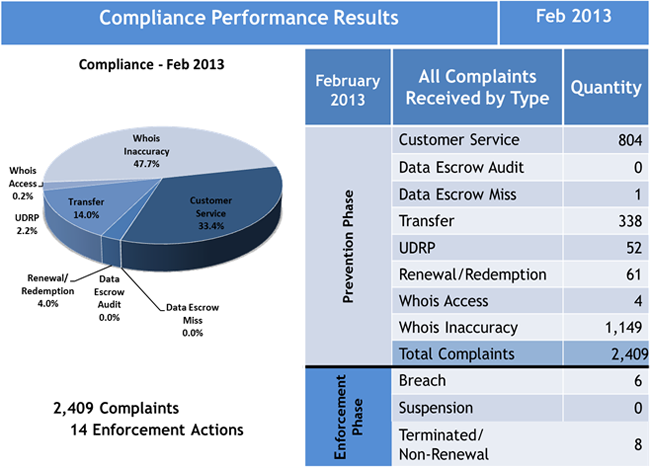 ICANN held two outreach sessions in February for the Year One Audit Program. The sessions reviewed the overall survey results with both Registrars and Registries in attendance. The survey was titled, "Request For Information (RFI) Phase – Audit Program Year One Continuous Improvement Survey" and was completed by over one-third of all contracted parties audited in Year One. The feedback received on the following areas for improvements - Process, Communication and Tool - has been captured and will be reflected in the Year Two Audit Program. The ICANN Contractual Compliance Audit Program, in the Audit Phase since 7 January 2013, is focused on document reviews and on generating individual Audit Report to each participant. An Audit Report will be sent to each Year One Audit participant starting in March 2013. The report will either highlight a "No Deficiencies" audit report, which will require no further action, or "Deficiencies" audit report, which will require further action (including an action plan with expected dates of remediation and/or evidence to immediately cure the issue). Please refer to http://www.icann.org/en/resources/compliance/audits to learn more about this program. 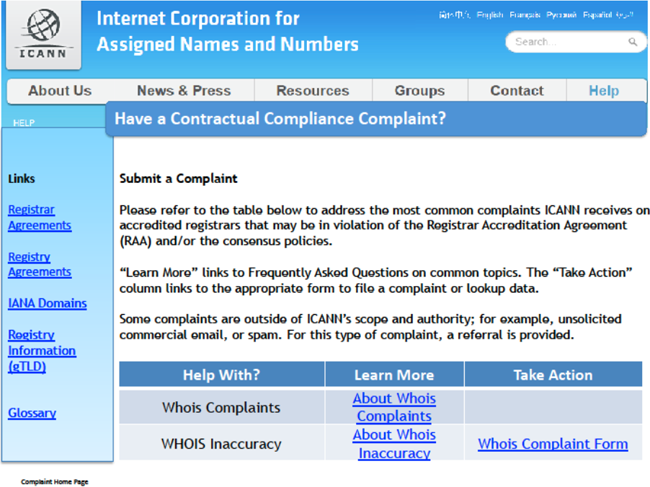 Please refer to http://www.icann.org/en/resources/compliance/notices for up-to-date information. 1 This update is provided for information purposes only. Please do not rely on the information contained within this update to make conclusions or business decisions.